APS Amino-Plex is a dietary powdered supplement containing branched chain amino acids (BCAA), additionally enriched in glycine, alanine, lysine, L-Citrulline malate and also conjugated linoleic acid as well as coconut and safflower oils. Systematic supplementation of the preparation causes considerable improvement of regeneration, thanks to which it enables the growth of strength and muscle mass. Branched chain amino acids (BCAA) are leucin, isoleucine and valine. When taken around training time they counteract muscle tissue catabolism caused by intensive training and lead to the synthesis of muscle proteins, due to which they should be an indispensable element of the diet of sportsmen and physically active people. The product also provides highly effective dose of BCAA, which ensures effective help in the proper growth of muscle tissue and its post-workout recovery as well as faster return to subsequent training sessions. Each portion of the product contains a high dose of leucin, which is a factor stimulating muscle anabolism, as it activates mTOR kinase, which is a protein responsible for the regulation of growth, proliferation and movement of cells and the processes of transcription and translation. Valine plays an important role in cell metabolism of skeletal muscles and it also takes part in maintaining nitrogen balance of the organism. Isoleucine increases endurance and supports the repair of damages and muscle regeneration. It is believed that the application of glycine in combination with simple carbohydrates enables faster utilization of glucose and thanks to this, the amino acid may contribute to the growth of muscles and positively influences the process of regeneration of damaged tissues. Alanine plays an important role in transferring nitrogen between muscles and the liver and is a substrate in the process of gluconeogenesis. Its proper availability has positive influence on the course of energy processes, also during physical effort and additional supply is recommended in case of sportsmen and active people, practicing endurance and endurance-strength disciplines, in the period of intensive trainings and during the diet with energy deficit. Lysine plays a key role in the absorption of calcium and by cooperating with the remaining essential amino acids, it takes part in building muscles and maintaining proper nitrogen balance of the organism. Conjugated linoleic acid (CLA) is one of the best-researched compounds characterized by a wide spectrum of pro-health effects. It has anticancer, anti-atherosclerotic properties, supports fatty tissue reduction, facilitates the functioning of the immune system and increases sensitivity of cells to insulin. Along with the rest of the ingredients of the preparation, it supports the organism in appropriate regeneration and provides essential elements for the proper functioning. Coconut oil is characterized by the high content of fat, out of which the majority are medium-chain fatty acids (MCFA). Contrary to saturated fatty acids with long chains, their absorption takes place without the participation of pancreatic lipase and bile. The absorption of MCFA takes place directly to the circulatory system and then to the liver, where it is subjected to quick β-oxidation with the release of large amounts of energy, which may be utilized for current needs of the organism. Energy generated in such a way is stored in the form of fatty tissue. Scientific evidence says that the application of medium-chain fatty acids supports body mass control and their thermogenic effect limits weight gain. Safflower oil is the source of large amounts of linoleic acid (Ω -6) and vitamin E. Scientific studies say that regular application of safflower oil reduces inflammations, improves cholesterol level, supports fatty tissue reduction and the growth of muscle mass and it also improves sensitivity of tissues to insulin, which plays an important role in after-training supplementation of muscle glycogen and the whole range of recovery processes. L-Citrulline malate is the combination of malic acid and citrulline, which is a non-protein amino acid widely used in the diet of sportsmen. It is converted to L-arginine in the human organism and thanks to this it increases the production of nitric oxide (NO) and causes that we experience the phenomenon of muscle pump more intensively and scientific studies show that its supplementation contributes to the improvement of effort abilities and the reduction of fatigue. 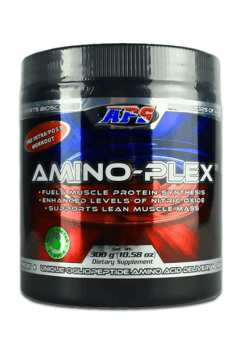 To sum up, APS Amino-Plex is a dietary supplement which complements the needs of the organism for branched-chain amino acids and is addressed to physically active people. Systematic application of the product enables the improvement of muscle regeneration and consequently better effects of training. It is suitable for everyone, regardless of the goal. It also works great during the periods of building muscle mass as an anabolic agent as well as during weight loss, playing the role of an anticatabolic agent. Take one portion a day, before or after training. Take one portion a day in the morning, on an empty stomach. The main aim of the preparation is the protection from muscle tissue catabolism and also the optimization of the processes of protein regeneration. The preparation should be used around training (before, during or immediately after). The product may also be used on non-training days in the morning on an empty stomach in case of the appearance of long and unplanned breaks between meals. Citric acid, malic acid, maltodextrin, natural and artificial flavors, sucralose, acesulfame potassium, silica, red #40, blue #1. Coconut oil is produced from the fruit of the coconut palm (Cocos nucifera), it has a long shelf life. A rich source of medium chain fatty acids MCT. MCT contain, in the carbon chain, from 6 to 12 carbon atoms and have the thermogenic anti-bacterial potential. Digested by pancreatic lipase and sent directly to the liver, they are a fast and renewable source of energy. Useful programs for weight reduction and muscle building and in the prevention of atherosclerotic diseases. Coconut oil is a source of polyphenols (such as gallic acid), vitamins and minerals. It is a component of preparations of multidirectional action, available at www.muscle-zone.pl.